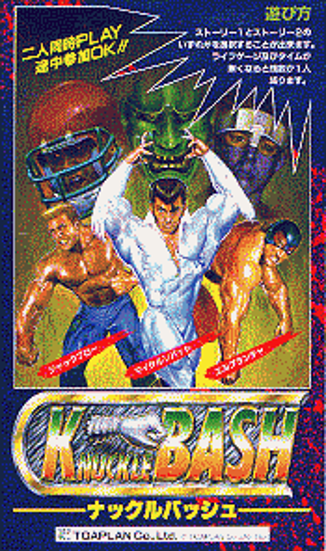 Knuckle Bash is a professional wrestling themed brawler from Toaplan, who normally make space shooters. 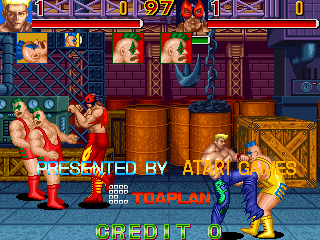 It's notable for its dual campaigns, unlockable extra fighters, boss-heavy gameplay, and digitized character portraits. Becoming a professional wrestler has always been my dream. I'll fight to the end to save the sport from the corrupt Mad Bulls. Wrestling heros unite! In a Chicago hotel, a secret meeting has been arranged. 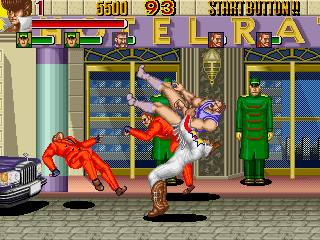 The heros decide to obtain the services of a powerful master of NINPOW. His name is 'HAYATE' ninja warrior. He resides in Hong Kong and is known to be a skillful and cunning fighter. 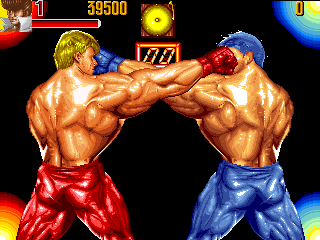 Knuckle Bash was developed by Toaplan, who normally only develop bullet-hell shooters. 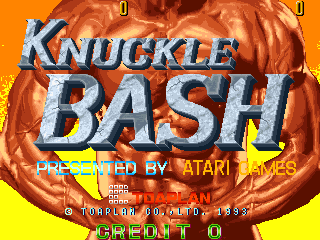 A version of this game entitled Knuckle Bash 2 exists, but it's exactly the same game with a different title screen and possibly some bug fixes. Knuckle Bash has the most intense-looking end boss I've seen in any brawler. 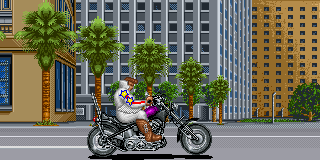 On top of that, the other enemies and bosses are generally really memorable. 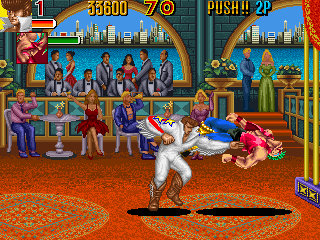 Although the gameplay is solid, most enemies are fought in the same way and the combat feels sort of off. Also, the music is sparse and not that great. However, its insane style compensates for this.